Several prominent, established artists join younger in “PROPHECY: Healing Time.” All participants share certain concerns in common. Among them are: Gaia, or Earth as provider-Mother and living organism; commentary and critique of contemporary society and values; and an understanding for and expression of cultural inter-relationships. This exhibition engages social, political and environmental issues in an aesthetic context. Richard Akers, director of the Art Department at Contra Costa College, has shown his sculpture, paintings and ceramics in solo and group shows throughout the world. 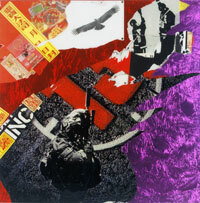 For “Prophecy”, he has contributed four key works from his “Cores from Ground Zero” series. These epic-scale ceramic “cores” resemble totems or steles. Shown in pairs to metaphorically allude to the Twin Towers, they stand prominently in the large space of the gallery. Images of faces, compressed bodies, elements from popular culture, Mayan and Buddhist symbols combine to express the inherent destructive impulses that lay within humanity and perhaps also speak to our desire to recapture what has been lost. Chema Gonzalez, painter from Guatemala, creates startling realist watercolors that portray in great detail the landscape, people, dress and everyday life in the villages of his homeland near Lago Atitlan. These vivid, micro-infused renderings, almost illustrative in their fixation on minutiae, are powerfully intimate visual narratives of a place and of lives so different from our own technologically-infused existences as to appear surreal. Robert Hernandez, represented by the Patricia Correia Gallery in Los Angeles and recently acclaimed at the Mexico City Art Fair, collects images from billboards and advertisements throughout the world. These artifacts of contemporary consumerism are re-configured into multi-dimensional collages that critique the very things they picture and for which they were originally intended to advertise and sell. Potent political and social messages are inherent in these images suspended in many layers of clear medium. Roberta Loach, past editor of Visual Dialog whose work has been seen in numerous exhibits over the last three decades, is contributing a selection from her “Vanished Societies” series among others. These colorful oil paintings, portraying indigenous peoples throughout the world, utilize satire and startling contrasts to remind the viewer of the pernicious influences of technology and cultural imperialism. Two paintings, “Dubious Enculturation No. 1 and No. 2,” picture male and female Kayapo Indians of Brazil. The man in indigenous garb wears a brightly-colored tourist’s “novelty tie” around his neck. 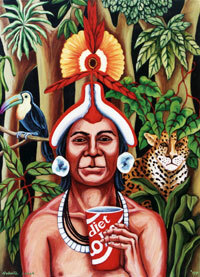 The woman in traditional headdress holds a Diet Coke. 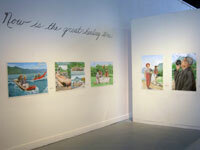 Carlos Loarca is a noted Bay Area artist who is invited to exhibit frequently. His paintings, sometimes involving mixed media construction to build up from the surface, utilize symbols and images that evoke dreams, metaphors, deep experience, reality and unreality. These images, with their intense and saturated color, reflect his early life experiences in Guatemala as well as his emigration to and long-time residence in Northern California. The brilliant colors, anthropomorphic symbols and painterly decorative motifs reveal his life-mediation between cultures and levels of consciousness. Diana Marto addresses issues of Gaia. Her performances and mixed media paper pulp constructions have been seen in Kyoto, Hong Kong, South Africa, Greece as well as in Northern California. For “Prophecy” Marto has created “Inside,” a site-specific installation. Inhabiting the separate smaller space off the Main Gallery, “Inside” is comprised of sculptures, drawings, and huge paper pulp hangings studded with stones, bones, kelp and other organic materials. It ultimately invites visitors inside to view a video slide display documenting the physical deterioration right down to the bones over time of a beached whale near the artist’s Big Sur studio. Betsie Miller-Kusz began exhibiting in 1974 and has had many one-person and group exhibitions: held nationally in San Francisco and the Bay Area, New York, Boston, New Mexico, and internationally in Paris, London, Spain, Italy, Mexico, Guatemala, Japan, Mongolia, and Russia. She has painted numerous public murals, and collaborated with international artists in many different projects, artists’ conferences and cultural exchanges. She is currently the Gallery Director at SomArts Cultural Center in San Francisco. 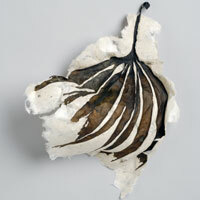 Her recent work combines figurative imagery with images from the natural elements: earth, air, fire and water. The work explores the relationship of the human and the absolute, often in the image of a guardian figure who appears in the paintings submerged in water, then walking upon the earth, engaged with Mayan hieroglyphics and other universal symbols. Irving Norman, who died in 1989, created epic-size paintings, many of which are in museums collections including the San Francisco Museum of Modern Art, the Smithsonian American Art Museum in Washington, DC and the Fine Art Museums of San Francisco. He is known internationally for his powerful critiques of modern life in the hope of promoting social change. Often called a “Social Surrealist,” he pictured exhausted crowds of office workers, soldiers lining up as cannon fodder, the homeless, the despondent, the used and abused, avaricious power-brokers, the wounded in war. A major exhibition of his work, initiated at the Crocker Museum of Art in Sacramento, is now traveling nationally. His wife, Hela Norman, has generously loaned several works. Alfredo Paz is a dancer and installation artist who addresses issues of ancestry, culture and the past using montages made of artifacts, images, and narratives from his native Mexico. For “Prophecy,” Paz has re-created his “Table of Ancestors”, which reflects his own living environment within the context of the familiar—a dining table at the family ranch where he once lived. 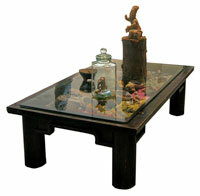 The glass-covered tabletop reveals those artifacts of recollection as well as providing a transparent foundation for glass vitrines containing more evidence of that past. At the reception on August 2 and again on August 11, Paz will perform a contemporary interpretation of the indigenous Indian “Danza de Venado” (Deer Dance), known as a vehicle for spiritual odyssey throughout the Americas. Clayton Thiel, professor in the Art Department at Chabot College, uses clay as a medium for expressed humanism. 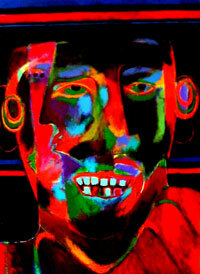 In his sculptures the human form and face are explored and revealed with disarming depth. The allusions to numerous cultures are apparent: Assyrian, Greek, African, Egyptian and Toltec influences subtly emerge. In the series of giant “Spirit Heads” exhibited here, the viewer encounters grand reflections of his/her own observation. The works are disarmingly powerful, steeped in historical context, yet completely contemporary, inscrutable but humanly accessible.